Have you ever thought about how many habits we complete daily that we formed when we were kids? Psychology Today reports that many of our current daily habits were ingrained in us by the time we were 9 years old. Teaching good habits early on is vital to our children’s success in keeping them for years to come. Recently, I’ve been reading Rich Habits by Thomas Corley where he shares 10 daily success habits of wealthy individuals through a short story based on statistical findings. While I don’t necessarily plan on myself or my children being America’s next billionaires, it is interesting to see how those who have found financial success have managed to do so. 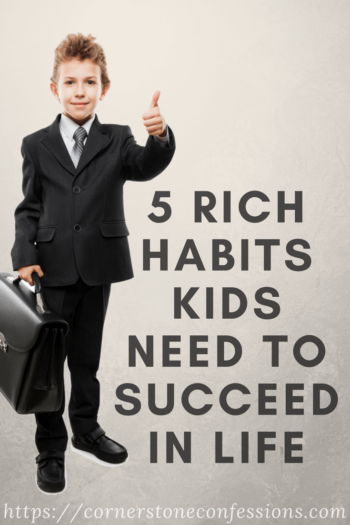 It has also helped me to think about how to establish habits in my children now so that they can be successful in the future at whatever avenue they choose to pursue. Using Corley’s book as a guide, here are 5 habits I have chosen to teach my children now to prepare them for success later. #1–Set SMART goals and strive to obtain them one step-at-a-time. Did you know that people who set goals are 10 times more likely to succeed? Learning how to set goals early on is important, but learning how to set goals is just part of the plan. Children need to not only learn how to set SMART goals, but they also need to know how to break their goals down into bite-size pieces. Successful people create daily, monthly, yearly, and even long-term goals. This is a learned habit, not an innate one; kids need to be taught this skill. Need some help getting this started? I like these kid-friendly SMART goals worksheets by Tara on Embark on a Journey, Jessica on What I Have Learned, and Erin on Royal, Baloo. #2–Engage in daily spiritual habits. Help your child early on to establish his/her own plan for reading, memorizing, and praying God’s word. Corley shares in Rich Habits that successful people “engage in the process of self-improvement every day.” I can think of no better object for self-improvement than the study and application of God’s word. Kids are already learning so much daily through their school subjects, but how are they improving themselves apart from school? Bible may even be a core subject, but have they taken responsibility to develop a PERSONAL relationship with Him on their own turf? How are they devoting themselves to growing as a follower of Christ? Proverbs 22:6 says “Start children off on the way they should go, and even when they are old they will not turn from it” (NIV). Help them to establish a quiet time now, so that it is an ingrained part of their day when they are grown. The Mayo Clinic suggests that kids need to spend a minimum of 60 minutes exercising every day to grow up healthy and strong. However, apart from events planned for them (sports activities, PE classes, dance classes, and recesses) few students ever establish an exercising habit. The girls and I have recently taken this to heart and have started the habit of exercising 30 minutes every morning upon rising. Some days we work on a C25K schedule and some days we do mat workouts. Either way, we are establishing a regular habit that will be able to last long after they have finished their school days. It also helps to keep us healthy as a family in the process. In short, unsuccessful people are critical of themselves and others while successful people are grateful for the life God has given them. Help your child to recognize reasons to be thankful each and every day. One of the easiest ways to do this is to have them create a daily gratitude journal in which they write something that makes them thankful. Possible gratitude statements could include things like “I am confident.” “I love learning in school.” “I enjoyed meeting a new friend today.” “I paid for my mother’s birthday present by myself.” Whatever brings them pride and fills their hearts with thanksgiving, encourage them to write it down and thank God. #5–Have a savings and giving plan. As several financial gurus encourage, paying yourself first is what separates the successful from the unsuccessful, and giving says more about your heart than your financial status. We want our kids to grow up loving the Lord and able to share with those around them. With that as our goal, we are constantly using things like the Kingdom Code to establish these character traits and habits early on. While life throws curve-balls, with these 5 habits our children will hopefully be better equipped to live healthy, loving, and successful lives as adults. How are you preparing your kids now to be successful in the future? What habits would you add to this list? Share with us on Facebook!